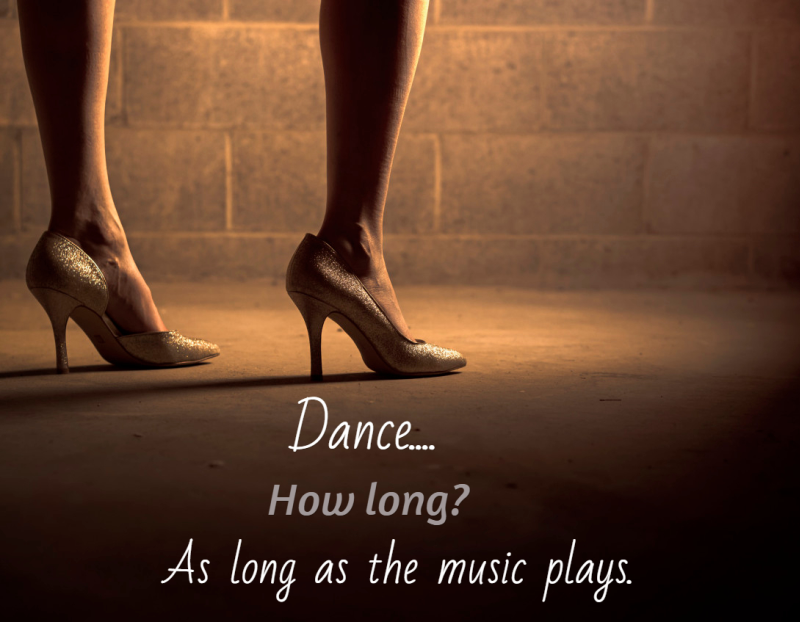 Dance… as long as the music plays. When it comes to the subjects of aging well or coping with illnesses, one of my favorite sayings is this: “Dance as long as the music plays.” Tragically, yet understandably, most people – when they either reach a certain age or a certain point in their illness when their fight begins to leave them – turn their attention from living to dying. They stop enjoying the world and begin missing the world…. long before they even have to leave it! Short story: My father, Larry Joe (how perfectly southern is that name? ), battled horrific illnesses most of his adult life. The things this man had to deal with would make the rest of us shake with embarrassment over the things we complain about. A doctor at Vanderbilt once told my mom that my dad’s level of pain was almost unheard of – and that it was relentless. He likened it to pouring salt water in an open wound. Over and over and over again. Each morning brought waves of nausea that he would joke about being his “morning sickness without a baby to show for it.” One by one, things that he loved to do (working – he loved his job!, gardening, umpiring softball games, walking with his granddaughters..) had to give way to sitting in his recliner watching reruns of Matlock, Rockford Files and Perry Mason. His body robbed him of health and it robbed him of many, many years but it never robbed him of his love of life. During his last hospital stay, he made jokes about the food and teased my mom by saying their food even made him anxious to get home to her’s! For one thing, he had fun with life. There wasn’t a day that he wasn’t finding something to laugh about. And if that something didn’t appear, he’d create it. I could always see it building in his face – I’d think, “Uh oh, here it comes.” Daddy was a sweetheart but he had a crazy sense of humor and you’d always kind of want to brace yourself for it. If life wasn’t living up to his sense of humor, he had no problem with creating a little craziness. He’d get that sparkle in his eye and you knew someone was going to get roasted, you just hoped it wasn’t you! He focused on the beauty in life and turned away from the ugly. How many people just seemingly STARE at the ugliness in life? Not only do they stare at it, it’s almost as though they search it out.. then they share it all over social media. It’s kind of like, “I’m focusing on this ugliness and now I want you to as well.” The summer before he died, my dad fell and broke his hip. He had to have a hospital bed delivered to their home and even required a walker for several months after his surgery. I guess it’s because I knew it was so close to the end, but the sight of that walker and hospital bed made me want to cry. He would, as you’d expect, make jokes about them. The only thing I ever heard him say about the walker was that he was very grateful for it because, unlike his granddaughters, he wasn’t much of a crawler. Finally… what can we learn from this jokester? He danced…. for as long as the music played. And he didn’t sit one song out. As we grow older, we have to be on guard for dark clouds that come swooping in. Dark clouds that remind us of things we no longer are able to do. Clouds that whisper that time isn’t on our side. Clouds that remind us of health issues, aches, pains, and what have you. Is there a lot of truth to what they have to say? Sure. Those morning aches aren’t exactly fictional, are they?! But here’s the thing – you can’t focus on any of that nonsense. Where’s the joy in that? Whether age or illness (or if you’re really showing off and are up against both) has brought a few visiting dark clouds into your world, here’s what I want you to do. Don’t ever focus on the end of the song. Focus on the music and let the end work itself out. Focus on living and focus on the beauty in life. By all means, focus on laughter. The more, the better. Someone I once knew taught me that every now and then, if life isn’t funny enough, you have to create your own. Just warn everyone first, okay? This was so refreshing to read. In a world where negativity dwells and reigns. Reading about somebody who is positive is a sure sign of hope. There is hope for a better tomorrow. But, to attain that future, we must learn appreciate today, with all its quirkiness and challenges. Yes, we must be at peace with today, for the tomorrow we desire to show up. Yes, we will dance as long as the music plays.